With autumn comes the delightful harvest-feeling of having a new book in print. Faces I Might Wear is a gathering of 200+ tanka written over the past 20 years and published in various magazines and online sites. I have spent much of my life wandering the byways of imagination, and I remind the reader that a poet speaks with various voices, sometimes wears makeup, sometimes wears masks. 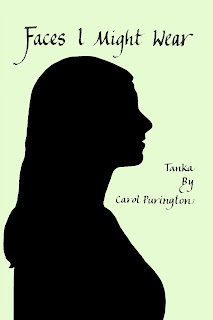 Please see the Poetry page for more about Carol's new book. Their children: Charles, Peggy, Herbert, Walter, Richard. Undated photo. Carol has been working on a family history. "Perhaps someday, some month, I will have copies of this segment of family history printed and passed out to lots of relatives. Meanwhile, this is a good beginning. And remember, the document is on a word processor so corrections and additions are welcome!" Page 1 of Family History - Part Three – George & Agnes & Children, 1900-1953 may be read below. The entire 15 page document may be read or downloaded here. For more than a decade I have been accumulating computer notes about our family, information of all kinds about Puringtons of all spellings. Some of the history goes back to the 1600s, but this document deals with the years from 1900 to 1953 – George’s lifespan, with Agnes’s story continued until her death in 1991. Perhaps someday I will write about the earlier periods. I also hope to bring together many more remembrances of the decades when Herbert, Bunny, and their 11 children lived on Woodslawn Farm, with frequent visits from aunts and uncles and cousins. Much material has been omitted because I felt it would fit better in another section. But some stories are not included because I have never heard them. So if you wonder why I left something out, please ask! I give special thanks to Richard for suggesting that it was time to begin gathering and recording and passing on at least some of what we remember. This account owes its existence to many persons and I’m grateful to all of them. Stories have been told and retold, questions asked and answered, photographs and documents examined. It is as accurate as slippery memories, limited access to old materials, and human weakness make possible. Storytelling is a continuing process. Other family members with access to such sources as courthouse documents, census records, town office reports, and newspaper archives will be able to add fascinating new information and replace some of my speculations with facts. At some point it will be possible, I hope, to illustrate this story with photographs. Presumably all genealogies have their twists and tangles, and our story is made more complicated to tell, as well as to follow, because of the several ways the last name is spelled. Feel free to skip! 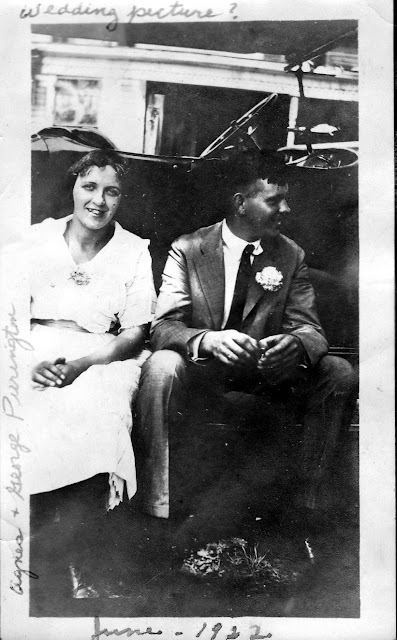 Agnes and George Purington, sitting on the running board of a car, perhaps on their wedding day, June 24, 1922? This photo was scanned from one of Agnes' photo albums. 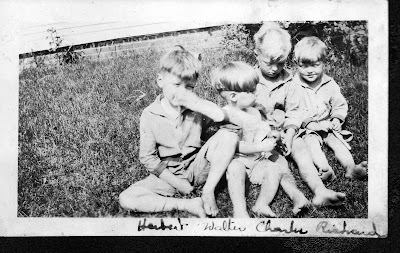 Four of the five children: Herbert, Walter, Charles, and Richard, circa 1929 or 1930. 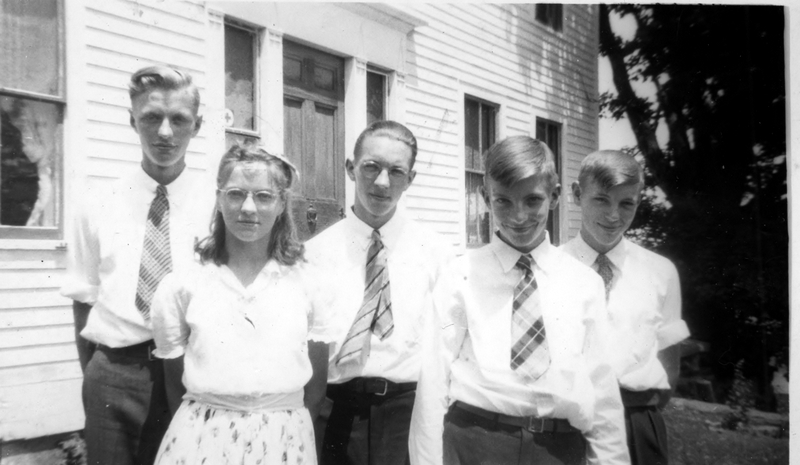 Peggy may not have been born when this photo was taken. This photo was scanned from one of Agnes' photo albums. 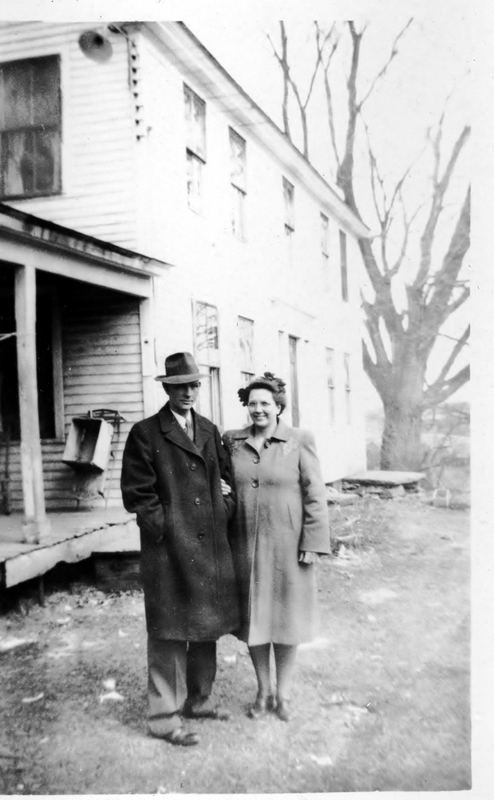 Agnes (Call) Purington (5th generation on Woodslawn Farm - see the History page) was nineteen years old in 1922. It must have been an exciting adventure for her because in the early 1990's's she would occasionally mention this trip while reminiscing about her youth. According to her son Herbert Purington, the friend mentioned in the brief news article was Mildred E. (Kingsbury) Totman. 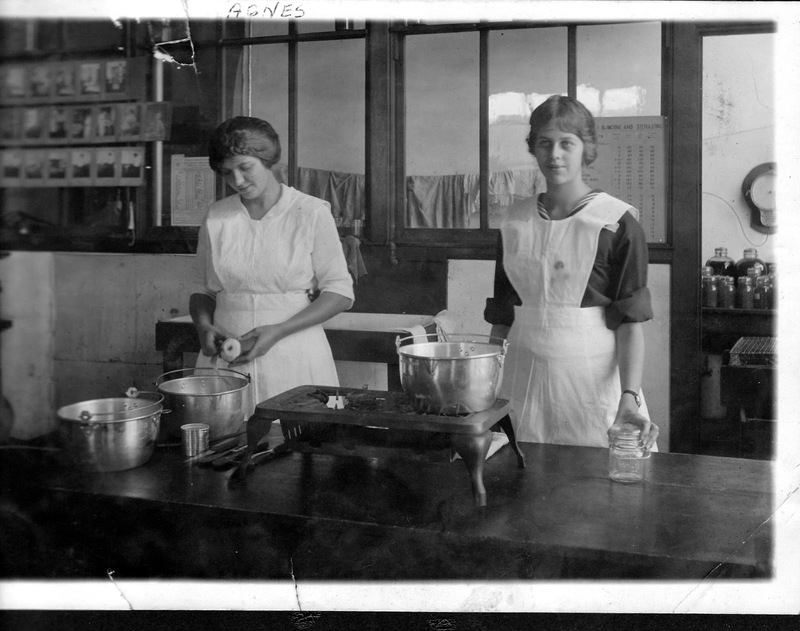 Agnes (left, peeling an apple) and Mildred working on their canning skills. Location and exact date of the photo is not known. Photo scanned from an album that belonged to Agnes. They qualified for the Chicago contest by first winning local and regional contests, and then by being one of the top two teams at the sectional competition in September at the Eastern States Exposition (now known as the Big E) in Springfield, Massachusetts. 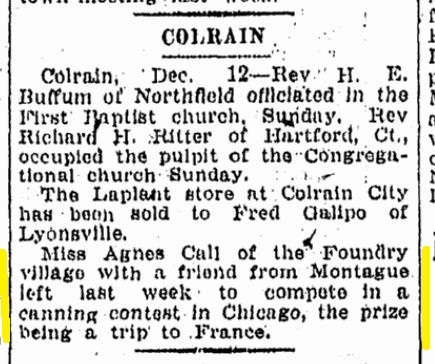 It was estimated* that 55,000 "rural girls" competed nationally for the opportunity to win the prize in Chicago. The winning prize in Chicago, "a trip to France", was not a carefree tourist's vacation. And the winners were . . . First Place: Beulah Rodgers and Katherine Dolidaugh of Eddyville, Iowa, and Second Place: Bertha Roger and Elaine Hendricks, Kit Carson County, Colorado. 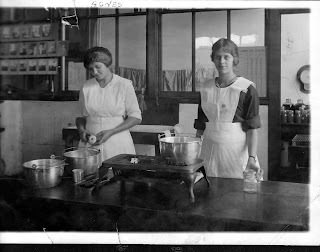 "Although ranging in age from 14 to 17 years, the girls displayed a range of knowledge worthy of the most famous chefs." * Detailed information about the competition and prize trip may be read on page 52 of the August 1922 issue of FARM MECHANICS. The article is titled "Champion Girl Canning Teams Go To Europe".